Sometimes a chance encounter with a work of art can have unexpected ramifications years later. Six years ago, I was in Tokyo, working as a part-time lecturer in Japanese art history and freelance translator when I happened to see the advertisement for an exhibition at the Takashimaya department store in Nihonbashi. What attracted my attention was not the name of the artist whose work was the main focus of the show, but the image of a goldfish that seemed to come out directly towards me from the poster. I had studied Japanese art for over ten years and have done my post-graduate degrees on various aspects of Japanese painting, but had never heard about the artist Kamisaka Sekka or seen anything so unconventional and humorous as his painting of a goldfish bowl. 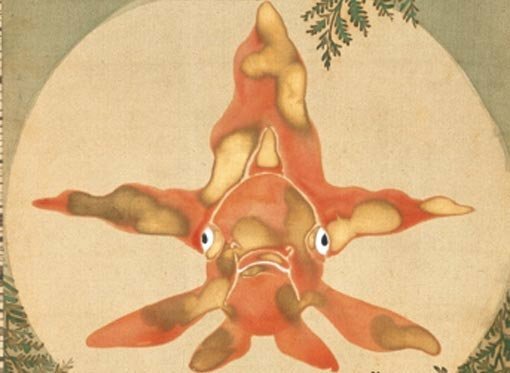 Curious to see the whole painting – the poster shows only a detail of the goldfish – I went to see the exhibition and discovered a whole new aspect of Japanese art. I thought that if I ever worked again as a curator, I would try to conceive an exhibition that included the goldfish, which would also give me the opportunity to see it everyday for an extended period of time! As things turned out, I was appointed curator of Japanese art at the Art Gallery of NSW a year later. The exhibition Kamisaka Sekka: dawn of modern Japanese design is a much larger project and encompasses not only works by Sekka but also the whole decorative tradition of Rinpa of which he is an important exponent. His Goldfish bowl is not the main work in the show, which includes so many masterworks by artists from the early 17th century up to the present date. But it is the work that started the whole idea, and I am more than pleased to be re-united with it for a month.